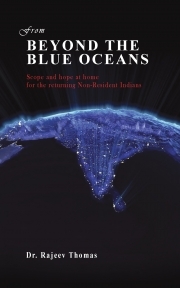 Description of "From Beyond the Blue Oceans"
30 million overseas Indians across the world have played an undisputable role in the development and prosperity of their host countries. Now some of them have packed their bags and are returning home to India for good, while many others are still contemplating. What’s holding some of them back? What’s motivating others? Is this the right time for a return to India? Do some of them even have a choice? Will there be enough jobs? Can they help transform India through their international exposure? What’s the scope and hope at home for the returning Non-Resident Indians? Reading this book will provide you the answers. Dr. Rajeev Thomas is a researcher, author, transformational coach, management expert, and blogger with over 25 years of a unique combination of experience especially in the Gulf countries. He has worked with various policy makers, decision makers, and advised on diverse topics within his domains of expertise. In his pursuit of continued education, he embarked on a journey of research into a subject close to his heart - the plight of Non Resident Indians, leading to his being awarded a Doctorate in Philosophy (Ph.D) in Management. This book is an abridged narrative version of his thesis, rewritten in the language of the common man. His recommendations based on his research have started drawing attention at various levels in India and overseas. He is also actively involved in various socially focused projects and is an active promoter of the concept of social entrepreneurship, and public-private partnerships to alleviate and address pressing social needs. An earlier book of his celebrating the lives of fathers across the world titled “My Father,” and a similar book he co-authored celebrating mothers titled “My Mother” - both saw its entry into the Limca book of records. He currently lives in Doha-Qatar with his family and exploring ways to make constructive difference in the lives of people he comes across. He recently also launched his pet project Vaapas.com which will help NRIs return to active employment in India, and offer them a host of other services. Dr. Rajeev Thomas M.A., M.B.A., Ph.D. Reviews of "From Beyond the Blue Oceans"